With most Dynasty Warriors games and spinoffs, you have a good idea of what you’re going to get going in: big maps with multiple objectives, huge amounts of enemy soldiers, and lots of hack-and-slash gameplay with flashy combos. Dragon Quest Heroes 2 is no exception to the classic Dynasty Warriors formula, but by adding classic elements from the popular JRPG series, it breathes new life into the somewhat repetitive series. With these additions, Dragon Quest Heroes 2 feels like the best of both series, despite one or two moments when the two vastly different franchises clash. The story of Dragon Quest Heroes 2 is a familiar one: the peace between seven kingdoms is broken, there’s an ominous prophecy about to come true, and it’s up to you to form a team of heroes from the different kingdoms to put a stop to it. It’s by no means an original story, and you probably won’t be surprised by any of the twists and turns, but the localization is fantastic. Each character has a distinct voice and personality, and the dialogue is funny, if a bit too reliant on puns at times. It also helps that Dragon Quest 2 looks amazing. The iconic monsters and characters designed by Akira Toriyama that scatter the battlefields and the countrysides are a treat for the eyes, and they move and attack with a distinct sense of personality. There are a ton of different monsters to fight, so if you’ve been turned off of Dynasty Warriors games in the past because you don’t want to keep fighting the same enemies, you don’t need to worry about it this time around.There’s also a sort of pseudo-open world to explore as well. As you progress, you unlock new areas to explore, as well as the abilities needed to fully explore them, dotted with random encounters with enemies. The overworld gives the game a huge sense of scope, not unlike the RPG series the game is based on. Speaking of scope, the levels are incredibly varied both in terms of environment and style. While there are plenty of Dynasty Warriors-style levels, with huge maps, tons of enemies, and multiple objectives to secure, there are also dungeons to explore. The dungeons are on the more JRPG end of the spectrum, and have puzzles to complete as well, though these puzzles are probably the low point of the game. While puzzles based around clever use of teleporters are fine in a slower-paced RPG, in a fast, combat-oriented hack-and-slash they only serve to bring the pacing down. That said, the bosses are a joy to fight. Each of the bosses have unique attack patterns, and they all take the form of classic Dragon Quest characters. They also hit that sweet spot where they always feel like a challenge to fight, but never have too much health or take too long to successfully beat. The moment-to-moment of the gameplay is mostly your standard Dynasty Warriors hack-and-slash, but with enough to differentiate it from the other games. You can build up combos, mostly by mashing buttons, though there’s also a new magic system that adds some extra flair as well as helping with crowd control. You have to be a bit more strategic this time around, though, at least at the start. You don’t have many hit points or magic points at the beginning, so you’ll have to keep grinding and leveling up. If there’s one complaint I have about the core gameplay, though, it’s the camera, which feels wildly sensitive to the point that it’s difficult to run in a straight line. Another way the game differs is the RPG elements. You can switch to different classes, and different classes have different playstyles. There’s actually a lot of depth to the RPG mechanics, as each class, weapon, and fighting style can be leveled up in different ways. There’s also a medal system, which you can use to gain passive buffs, summon helpers, and even transform into monsters. Transforming not only can turn the tide of battles, but it can also unlock new movement abilities like flight to help you explore. 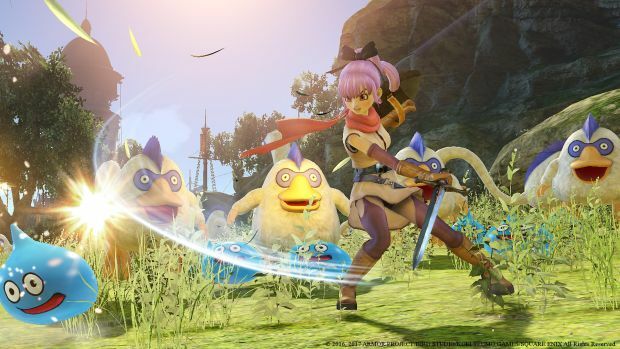 Dragon Quest Heroes 2 is a fast-paced, ridiculously fun hack-and-slash RPG. Even if you’re tired of the Dynasty Warriors style of hack and slash gameplay, the open world and massive amount of depth should be enough to keep you interested for the duration of the game. Camera controls are way too sensitive.